Own your software infrastructure instead of renting it! In today's computing world, end-user applications are embedded in complex networks and software infrastructures. To an ever higher degree, the usefulness of software depends less on the richness of "feature sets" and more on how well it communicates with other components in the infrastructure. Bundling the capabilities of many specialized tools, such an integrated system delivers more power and flexibility than any single application ever could, while maintaining elegance, simplicity and performance on the end-user level. 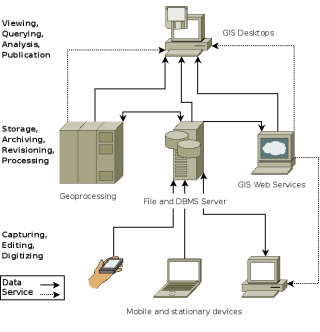 We specialize in the design and deployment of software infrastructures based on Free and Open Source Software (FOSS), particularly in the domain of spatial data infrastructures(SDI), which involve spatial databases and geoinformation system (GIS) components. Contact us for consulting services regarding these topics. The migration from closed source to open source does not have to be sudden and painful. It can be done as a smooth transgression, at sustainable speed, replacing closed source components bit by bit and giving users time to adapt to the new environment. If you have a business and are tired of spending a lot of money on redundant license fees and work-arounds for problems caused by incompatible applications: consider moving your data to a FOSS infrastructure. If you are planning a research project and do not wish to spend all your money on licensing fees, leaving you with no surplus value at the end of the project: consider integrating a FOSS tool chain into your planning. If you simply think that your current software is not up to it and you would like to look for alternatives, empowering you to create the software that really suits your needs: consider investing in open source software development. No more redundant spending on license fees. Pay only for what you really need: consulting, installation, help desk support, training and targeted development to suit your needs exactly. Make an investment once and have as many people benefit from it as you like! Take full control over future software development. No more paying for the next "update" of your favourite software, only to find out that the issues you were troubled by still have not been addressed. Instead, invest in developing the features that can really increase your productivity. Unlock your data! No more vendor lock-ins. Get rid of proprietary, closed source data formats and protocols for good. Be in full control over your data flow and sharing and ensure long-term archivability and accessibility of your digital assets. Make use of FOSS synergies. There is an enormous pool of FOSS components available right now. And they all communicate with each other using open file formats and protocols. Even without any investments in new software development, chances are good we will be able to find your solution by simply "plugging together" what's already there. Benefit from a strong FOSS community, shared investments and helpful user communities. Free your research! No more barriers to participation for students, researchers and anyone you would like to share your ideas, data and software with! Keep your research reproducible. Using FOSS for your research allows everyone out there to reproduce your analysis, even if they are on a minimal budget. Kick those black boxes out of your knowledge building chain. Full access to your research tool's source code means that you will be able to know exactly what happens to your data from input to output. In the 21st century, software is knowledge! Full control over your tool chain. Modify every bit you like in your software's source code and do not be restricted in your creativity. Spend your research money on developing the functionality you need for your research! Benefit from a world-wide network of FOSS-based researchers and developers to boost your productivity.